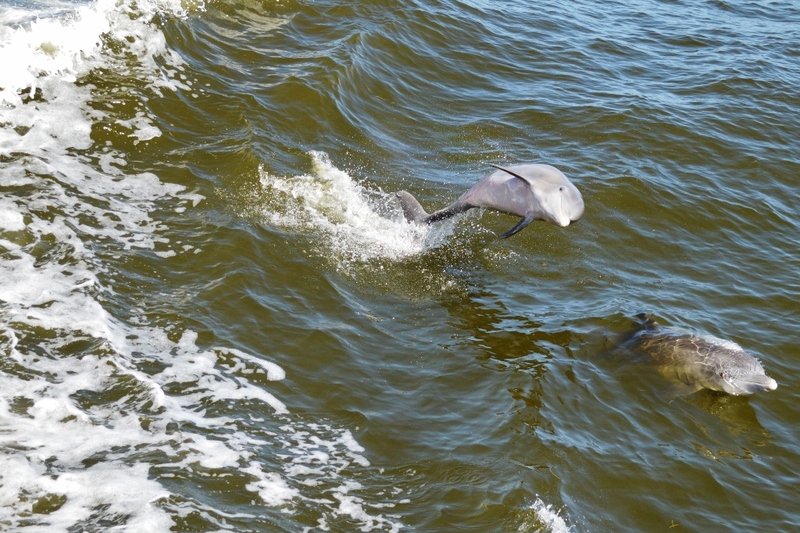 Who doesn’t get excited about dolphins?! I squealed right alongside the kids when about a half dozen leaped and bounded alongside the boat. The Capitan insisted our screeching and whistling helped encourage the jumping, but I think he just delighted in seeing the little ones lose their minds. There’s so many wild creatures that call the islands around Sanibel home that I encountered new ones every day. These days being on the road usually means work. But the trip to Sanibel Island was going to be best of both worlds – some time for writing and time for family. It hurt a bit to bring the laptop to such a beautiful place, but everyone pried it out of my hands once in a while so I could have fun. With the dozens of time I’d been to Florida, I never explored the Gulf Coast. It has a different feel – quieter, more homely and just as pretty. It was easy to fly right in to Fort Myers and make our way over to the island. My base was the Island Inn – a colorful haven near the ocean, well suited for casual couples wanting to escape for a few days. While many of the rooms in the main buildings are wonderfully updated with kitchenettes, plush bedding and sunny terraces, it’s wise to call and confirm your space, because each accommodation on the property varies greatly. Some of the cottages have more room, but the furnishings are slightly more dated. However, a family of four might feel squished in one of the newly renovated rooms, so just check with the staff and I’m sure they’d be happy to help you choose. My favorite detail were the plentiful frangipani trees that welcomed me outside my window every morning in white, purple and pink. Now back to the adventure. Captiva Cruises brought a group out to Cabbage Key- a lazy relaxing boat ride cutting through the water accompanied by dolphins and birds the whole way there. It brought us to the Key – a charming island with rumors swirling that Jimmy Buffet wrote his “Cheeseburger in Paradise” song about this spot. You be the judge, as they have plenty to support it – including a restaurant totally covered in dollar bills – for good luck from sailors and to mimic Buffet’s contribution to the bar. I wish we could have stayed here as well, as there is an Old World, simple feel to all the rooms and cottages here – no internet, just you, your dock to the water and maybe a few gopher tortoises rambling by. Boating seems to be theme of the experience as I also was able to explore the pretty mangroves in the Ding Darling National Wildlife Refuge with Tarpon Bay Explorers. Although my dream of seeing a manatee had to be put on the backburner there were plenty of other creatures sharing water space alongside our kayaks in the bay. The enthusiastic guide regaled us with stories about the plant species and how the water regulated a mild temperature and the tidal eco-environment, allowing birds, fish, small mammals and even the occasional gator thrive. Getting in a good workout after the tour paddling around the open bay was a highlight, especially as we passed by curious pelicans and were gleefully tossed around a little by lapping waves. As much as I love hanging out by the beach it’s always worth treating yourself to something luxurious wherever you go. This is why I was beyond excited that the Kay Casperson Spa invited Christian’s stepmom and I to their beautiful place on Captiva – just a short drive from Sanibel Island down a scenic, seaside road. The space is wonderfully airy and perfectly suit the island-style feel of Captiva – not to mention every one of the staff had a huge smile on their face when we arrived. Kay Casperson takes a unique approach to treatment – the signature facial is comprised if a simple yet invigorating step-by-step process that targets not only your skin but your mindset. Work on tranquillity, renewal, refreshment and more through each cleansing session. Everyone said I had a glow afterwards – never had I noticed such an instant difference ina facial before! I’m not used to getting pampered, but honestly, this is was of the best experiences I’ve had at a spa. I was immediately put to ease and felt like I didn’t have to have a care in the world. Plush robes and slippers were offered and each room was filled with gentle music (but not that tacky elevator kind!) and bright furnishings. They really left no stone unturned, even when it came to the facial bed. Each one is laid with a special blanket saying “You are Loved” with a personal story about a cancer survivor who created them for the cause. They are for sale online and at the spa as are all products used during the treatments. Did I have to leave? I wish I could have spent the whole day trying their other treatments or perusing their small boutique downstairs, but I know I’ll be making another stop in next time I’m on the island. Has a place ever surprised you? The Gulf Coast of Florida has a much different feel than I expected, and I loved it. I’m pleasantly awed by places all the time, like Mexico or Taiwan, but who knew there was wonder practically in my backyard? OK not quite the backyard, but same country!